Coco Libre, the pioneer of organic coconut water in the U.S., is unveiling a new product line, new packaging formats and a beautifully contemporary brand refresh at Natural Products Expo West 2016, Booth #5306, in Anaheim, Calif., March 11-13, 2016. The innovations reflect the company’s energized strategic mission: creating coconut water beverages with a purpose. New packaging format: Organic Coconut Water in 100% recyclable 15 oz. aluminum can. 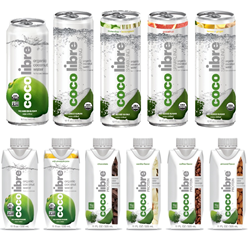 Refreshed brand look: A contemporary flair which updates the company’s signature elements to represent Coco Libre’s growing family of purposeful beverages. Coco Libre has additional products in the R&D pipeline, to be announced later this year, that will further differentiate the company’s offerings and excite customers and consumers. Coco Libre products, made in the U.S.A., are formulated from the foundation of its signature Organic Coconut Water, known for delicious flavor with no added sugar, certified USDA organic, OU kosher, gluten free and Non-GMO Project Verified. Every product extends Coco Libre’s brand promise to “liberate your thirst.” The company will be sampling the new products at Natural Products Expo West 2016, Booth #5306. Coco Libre’s flagship Organic Coconut Water is the nutritional foundation for a growing family of purposeful beverages. Coco Libre is a 2015 NCW Eco-Excellence Award winner and a finalist for Best New Product Line Extension at the World Beverage Innovation Awards 2014. Coco Libre beverages, made in the U.S.A., are available in grocery, natural, specialty and online retailers in the U.S. and Canada.